More than 50 organizations representing Black Lives Matter, women's rights, immigrants, the environment, laborers, LGBTQ groups and much more got on board. As announced on the Movement for Black Lives' website BeyondTheMoment.org, "We will strike, rally and resist. Our aim is to build a mighty movement of all people dedicated to freedom. That means we don’t deny our differences, we embrace them and build a movement bold, broad and big enough to include our many realities." Participating organizations, including 350.org, the Women's March, United We Dream, and Mijente, among others, have compiled organizing toolkits available for free on their websites, hosted multiple planning conference calls for participants all over the country, and created an event locator to help prospective protesters find events in their area. Many of these protests, rallies, marches and additional direct actions are centered around and will coordinate with the second Day Without Immigrants, which as AlterNet previously reported is organized by Movimiento Cosecha, a national immigrants' rights group that has been planning the nationwide strike for months. The campaign site explains, "On May 1st, we will not go to work, we will not go to school and we will not buy. We are going to make it clear that this country cannot function without immigrants." In addition to Cosecha, the immigrant strike is "backed by a network of over 300,000 farmworkers, servers, cooks and food-manufacturers, including a large local chain of the Service Employees International Union," and the Food Chain Workers Alliance. The goal is to show just how much American businesses rely on immigrant labor to keep the economy running. As the organizers said in a statement, "We need to show this administration, Congress and large corporate interests that our human and economic worth is more powerful than their agenda of hate and greed. Opposing Trump is not enough. We must stop him." Events are planned nationwide. In Houston, Texas, workers and allies will gather and wear red for a morning rally and march. In California (Oakland, San Francisco and Sacramento), there are multiple marches occurring throughout the day and even after 5pm, for those unable to strike during work hours. Also on the West Coast, in Vancouver, Washington, local chapters of the ACLU and Indivisible groups are meeting for a march and rally, also after the workday. Even deep-red Arkansas is hosting multiple events, including rallies in Little Rock, Rogers and Portsmouth, which as the Guardian points out, have large immigrant populations. In New York City, thousands of people will converge near City Hall for speeches by Women's March organizer and Palestinian American activist Linda Sarsour, Planned Parenthood president Cecile Richards, labor leaders, and New York City elected officials, as well as DACA recipients and other undocumented New Yorkers at risk under the current administration. Those looking to get involved or support the strikers can visit BeyondTheMoment.org or Movimiento Cosecha. On May 1, hundreds of thousands of immigrants and their allies are expected to take to the streets in a nationwide show of power. 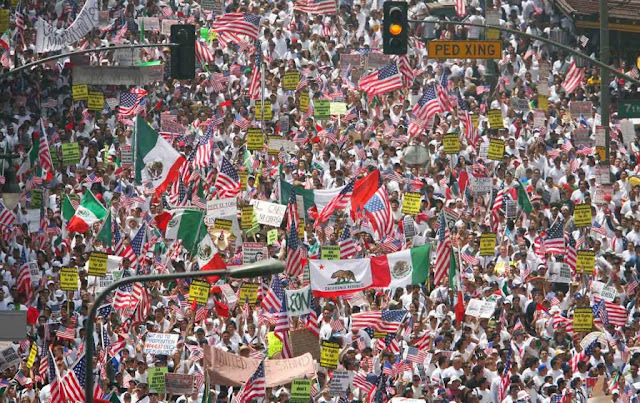 Immigrants have been marching on May Day for a decade now, first in 2006, when 1.5 million people took to the streets across the country to demand immigration reform. Until that year, May Day had been associated solely with International Workers’ Day; now immigrants have made it a day to demand their rights, too. 2006 marked a watershed moment; it was the first time immigrants and their loved ones took to the streets in such massive numbers. In the decade since, marching on May 1 has become an annual custom, and the day is a key national day of action for immigrant rights activists and advocates. Sadly, I have jury duty beginning that morning, but I'll armchair chronicle what I can and perhaps show up if I get sent home early. It'll be another sign to see if we can continue the momentum until the 2018 elections. Still a long way away.